If you or someone you know is looking for a home, give us a call. We just listed this 2001 sq. ft. home near Greenway & 35th Ave. The Current Market shows steady growth with moderate gains. The current low inventory of homes has helped raise the median home price in Phoenix 7.7% from a year ago to $228,400. New home sales are at a 7 month high and are 12.8% higher than a year ago. As with anything, the less there is of it, the more it’s worth. Now’s a good time to sell a home. Give me a call. Typically each year in Arizona, home sales fall during the holiday months. This graphs shows how quickly home sales fall once October hits and throughout November. This graph shows sales pick up towards the end of December and continue to rise through January of 2015. We are on track for a little better year than in 2014, but not by that much. Also notice the graph in May reach it’s highest point. It’s during the summer months when school is out when the most home sales occur. 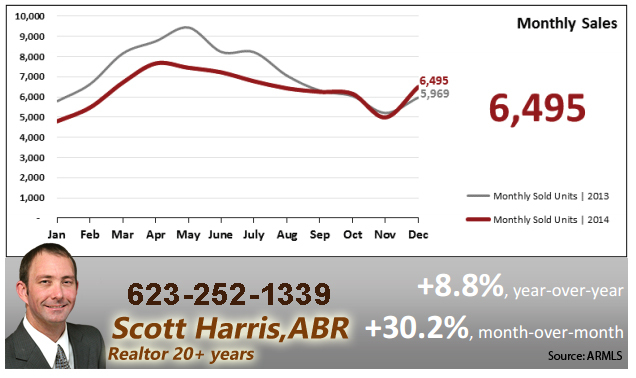 As of May 21 2012 there were about 15,019 single family and condo homes listed for sale in Phoenix Arizona. The median asking price of these homes was approximately $199,291. Since this time last year, the inventory of homes for sale has decreased by 39.4% and the median price has increased by 32.9%. It’s not just heating up outside, homes are selling as soon as they come on the market. Call me, Now’s a great time to sell! Multiple cash offers, no appraisal needed. The inventory is way down, but interest rates are at an all time low. That means buyers are willing to pay more! Reported sales for July dropped 24.6% from the June sales. We are very close to a normal Phoenix market.